Cardiomyopathy is the term for heart muscle disease. There is a decrease in the heart’s ability to pump blood due to muscle weakness or improper function. Ischemic Cardiomyopathy – The most common in the United States. Weakened heart muscle is related to obstruction or blockage of the coronary arteries or heart muscle injury caused by heart attack. Cardiac catheterization is often performed to prove or disprove this cause and to address high grade obstructions to blood flow to feed threatened muscle tissue. Medications are geared toward optimizing blood flow and reducing heart muscle workload. 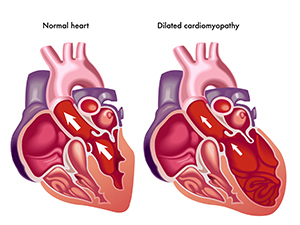 Dilated Cardiomyopathy – A common type of cardiomyopathy in which the heart cavity (especially the left side) is enlarged and the muscle is weak, diminishing the output of blood pumped by the heart. Dilated cardiomyopathy can cause leaky valves, poor output from the heart and occasionally formation of blood clots in the heart. Some cases are caused by a genetic predisposition, a post viral syndrome, toxins such as chemotherapy, cocaine or alcohol, or rarely may be related to pregnancy or vitamin deficiency. Hypertrophic Cardiomyopathy – A genetic disorder that causes the muscle of the left ventricle of the heart to thicken which prevents the heart from pumping blood properly. Restrictive Cardiomyopathy – The walls of the ventricle are rigid and do not allow for the normal filling of the heart chambers with blood. This is a rare form of cardiomyopathy. Symptoms may include shortness of breath, chest pain, fatigue, swollen feet, dizziness and fainting. Some patients experience abnormal heart rhythms. Diet - Watching your salt intake and avoiding foods with high sodium can help prevent fluid accumulation in patients with cardiomyopathy. Beta blockers (such as Carvedilol, Metoprolol) ACE inhibitors (lisinopril, ramipril), ARBS (Diovan, Losartan, Avapro) and Nitrates, all to decrease the work of the heart. Diuretics such as Lasix (furosemide) to rid the body of excess fluid that results in shortness of breath and swelling. Digoxin that can increase heart function. In patients with a hypertrophic cardiomyopathy calcium channel blockers have been shown to correct abnormal heart function. Coronary artery bypass surgery or stenting- if you have an ischemic cardiomyopathy, improving blood flow through surgery or stenting may improve heart function. Defibrillator- can help prevent life threatening heart rhythm problems associated with cardiomyopathies. Bi Ventricular defibrillators can improve heart function. If you are told you have a cardiomyopathy discuss with your doctor what he thinks is the cause. Since cardiomyopathies can run in families discuss whether other family members should be screened. Discuss what specific medicines and dietary changes will help. Discuss whether you may have an ischemic cardiomyopathy and whether you need a catheterization to see if surgery or stenting may help. If your heart function is reduced enough discuss with your doctor whether a defibrillator is advised.